GOT A QUESTION ABOUT YOUR BOUNDARY FENCE? and how to go about resolving them. situation and advise on the best way forward. Transfer plans Air Photo Interpretation. Add 2nd paragraph under "Amicable use of expert advice"
Add final sentence to 3rd paragraph and add 4th and 5th paragraphs to "Amicably negotiating with your neighbour"
Add long passage under the heading "Recent Developments in Boundary Disputes Practice"
Substitute revised downloadable edition of "JMB37, Boundaries Essentials"
Substitute downloadable "JMB37, Boundaries Essentials" for "JMB34, 10 Things About Boundaries Every Landowner Should Know"
Add panel headed "The Ministry of Justice identifies the causes"
2018 edition of "JMB33, Guide to Resolving Boundary Disputes"
Buying land: Getting proper descriptions of the boundaries before purchase? Add section "A property barrister's view"
"Land Registry plans do not show where the boundary is." Add section "Boundary Disputes and Harassment"
Does my Land Registry title plan define my boundaries? Can I use the title plan to work out the exact position of my boundary? Surely title plans must be right? "It is in principle unsound to determine the true position of a boundary through the process of mediation. It would, however, be legitimate for the parties to a dispute to negotiate (through mediation) a settlement to a dispute that involves knowingly altering the position of a boundary (and taking the appropriate legal steps to record that alteration) in return for some concession by the party that benefits from the movement of the boundary." Re-write the first part of the page to strengthen the message that Land Registry's title plans are not to be relied upon for the exact line of the boundary. Add section "When the Party Wall, etc Act 1996 applies. Add section "Objecting to your neighbour's planning application. Add two references to the Party Wall Act 1996. Remove referencves to the repealed Propery Misdescriptions Act 1991. Expand the section on the Law of Property Act 1925. Expand the section on the Party Wall Act 1996. Six additional and one extended definitions of terminology. Expand/rephrase "It will also help if you can find your way behind your neighbour's complaint to identify what is the real problem that needs addressing." Expand/rephrase ""	[eg. his drive is not wide enough to allow him to park a car beside his Victorian house - but there weren't any cars in Victorian times!]" New section on "Expert Evaluation". New section on "Giving the settlement permanence". Change references from "Adjudicator to Land Registry" to "Land Registration division of the Property Chamber (First-tier Tribunal)". Additional material on the "RICS Neighbour Disputes Service". Sundry further corrections and additions. Rename page from "Boundary Definitions of Registered and Unregistered Land" to "Boundary Descriptions"
Replace, where appropropriate, the words "define" and "definition" and their derivatives with the words "describe" and "description" and their derivatives. and is required by regulations to use an Ordnance Survey map on which to do so. ascertaining, altering, or affecting property boundaries. Update photograph of survey instrument. Added text "To overcome this limitation, Land Registry will accept determined boundary applications that are based on Ordnance Survey's National Grid coordinates." and altered text "In spite of the above limitation, determined Determined boundaries have a lot of potential ..." near to end of page. Buying a house: How do I check the boundaries? Buying a house: Searches reveal some of the land is unregistered. Buying a house: Searches reveal the vendor is adversely possessing some of the land. 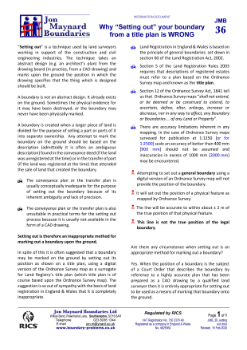 Add new PDF paper to FREE DOWNLOADS area - "10 Things About Boundaries Every Landowner Should Know"
Replace banner with "GOT A QUESTION ABOUT YOUR BOUNDARY FENCE?"